The free SEO plugins available on the web can help you monitor a number of different on page and off page SEO elements. These plugins are mainly available for Firefox but depending on the vendor they may offer downloads for Chrome & others too. As all the tools work in Google Chrome, I will be using this browser for my examples. If you need to download Google Chrome then you can find a link for it below. This is how to identify the icons in Google Chrome once they are installed. 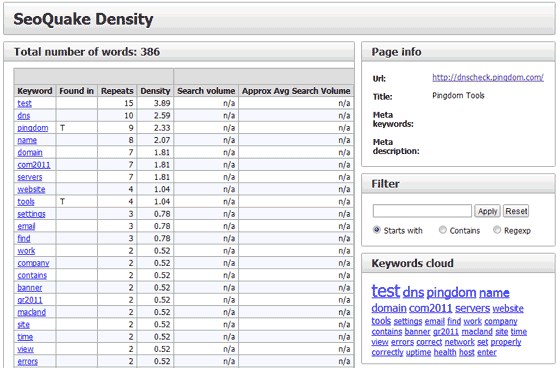 I use this tool mainly for one thing, showing the keyword density of a page. For a free tool, it’s easy to use and gives you what you need in seconds. 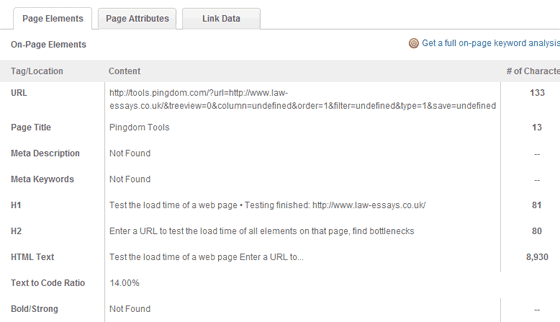 To check the keyword density of a page, follow the steps below. Open a page that you want to analyse. This could be a page on the Internet or your local development server. Left click on the SEOQuake icon and click Keyword Density. With a few seconds, a new tab will display showing you all the keyword terms used on the page and the percentage usage next to each one. Just keep tweaking your pages until you hit the percentage that you need to nudge your page up the rankings a little. If you want to see instantly the keywords a page is going after, then take a look at the Keywords cloud on the right hand side. The biggest keywords should reflect the ones that you have used in you Title & H1 tags. See a page’s PageRank as soon as it loads. This is indicated by the number just below it. Green = page rank of domain and no page rank for the page, Red = page rank of the page. External page data. Number of inbound page links and pages indexed by the search engines. Page elements. CSS & HTML validation errors as well as on page structure. Social media. The number of social mentions from the likes of Twitter and Facebook etc. Page tools. Speed test & plagiarism checker. Suggestions. Advising of possible page errors and how to fix them. The SEOMOZ toolbar is very useful for a free tool. It sits quietly in the tool bar until you ask it to do something. To bring it to life, click on the icon and a drop down window will appear with all the available options. Page elements. These detail your on page structure, meta content and use of H tags. Page attention to anything that says "not found". Page attributes. The main points of interest here are the on page links. Google recommends no more than 100 links per page. If you have any more than that then try and cut down on a few somewhere. Link data. This section gives you information on how much of an authority site you have based on the SEOMOZ ranking factors, which are similar to Google’s PageRank. To see more of the stats on this page like root domain links, you have to purchase the pro version of the tool. The other metrics like root domain links are very valuable in understanding how many you have compared to your competitors. This will allow you to adjust your back linking strategy accordingly and also check on what keywords they are using. SEOMOZ offer a complete set of SEO tools that are well worth the money. Get a free 30 day trial here.